When I last wrote about alternative cryptocoins — the universe of small bitcoin competitors — TerraCoin and PPCoin had just debuted, but by and large the list was a relatively stable one that included Litecoin, Namecoin, Devcoin, and a few non-functioning coins. All of these alt-coins paled in size and breadth to Bitcoin, of course, and as the chart below shows, this dominance continues to be the case. Since April, what was once a trickle of new alternative cryptocoins has turned into a veritable flood. Nowadays, a new coin is being announced every day, and it isn't rare for two or three to debut on the same afternoon. Almost all of these are "copy-paste" coins. Their creator simply takes the source code of a previous coin (usually Litecoin), alters a few parameters, and then announces its debut on the alternative crypto-currency forum at Bitcointalk. Most of the changes implemented by new alt-coins are arbitrary. RichCoin, one of the newest coins, sets an 88.88 million upper limit for the number of coin in existence and a block reward of 88 coins, presumably to appeal to the Chinese user (Bitcoin has a 21 million upper limit and block reward of 25). FastCoin targets a block generation rate of twelve seconds, compared to Litecoin's 150 seconds, and Bitcoin's nine minutes. These are little more than cosmetic modifications that involve changing a variable or two in the initial source code. New issuers usually jazz up their coin with a cheezy logo made in MS Paint, a website, and a silly gimmick, like SexCoin did by proclaiming itself as the coin "for the adult industry". Sometimes their creators forget to erase references to the coin they've copied. YACoin, for instance, launched May 6, was mocked for accidentally including NovaCoin's logo on its client, the coin from which YACoin drew its sourcecode. Apart from amusing errors like these, it seems that creating your own coin these days is as easy as printing up business cards. In fact, this blog post provides a complete guide for coining one's own fiat alt-chain. 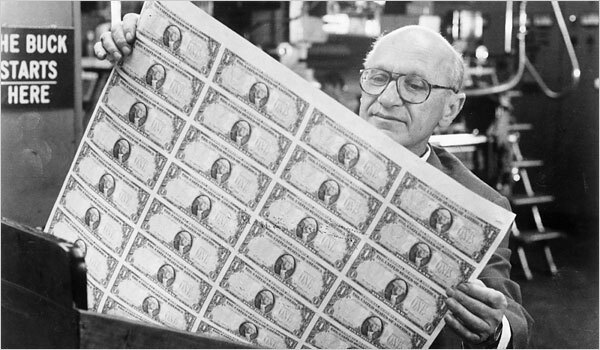 The great alt-coin rush seems to be a fine illustration of Milton Friedman's views on privately-issued inconvertible fiat money. As long as the reigning intrinsically valueless currency like Bitcoin, Litecoin, and others have a positive price, individual issuers will have an incentive to (almost costlessly) copy and paste new clones into existence in an effort to capture the premium. A great example of Friedman's dictum is the odd case of Somali shillings, vividly illustrated by William Luther. Though the Somali central bank was destroyed in 1991, shillings continued to circulate. Local businessmen and warlords printed counterfeit shillings and spent them into the local economy until the purchasing power of shillings was driven down to the value of paper, printing, and shipment. How does the profit incentive work in the case of new alt-coins? Here's how a new issuer makes a profit. Prior to announcing their new coin on Bitcointalk, the issuer "pre-mines" a few million coins for themselves. When the public starts to mine the new coin in earnest and trade it on the forums — a sort of over-the counter-market — the issuers seize the opportunity to sell all the coins that they've premined. More ambitious coin issuers endeavour to have their coin listed on any of the larger formal alt-coin markets like BTC-e or Vircurex, rather than the OTC market. This adds a larger liquidity premium to the coin, thereby improving the price at which the originator can make an exit. The lure of a listing is so tantalizing that NovaCoin, for instance, a coin premiering back in February, initially premined a quantity of coins which it used to payoff BTC-e in order to procure an immediate listing on its exchange (when controversy ensued, this payoff was later rescinded). Because premining is roundly vilified on the forums, and coin ledgers are public (rendering it fairly easy to determine if a coin has been premined), issuers have resorted to less overt techniques to profit from new issues. Insta-mining is one practice. An issuer and his/her confederates prepare their computers to mine the coin "instantly" upon the coin's public release on Bitcointalk. The ease of mining is set very low for the first few hours, allowing the issuer and his/her friends to snap up a large percentage of coins. Later, when the public begins to participate, the issuer ups the difficulty and sells their booty. In the first twenty-four hours of Feathercoin's existence, for instance, some 2.9 million coins were mined out of a total of 336 million minable coins, far more than would be mined on an average day. The dozens of coins issued in the last months are largely worthless, or close to it. You can track some of their prices at Cryptsy, an alt-coin exchange. This would seem to bear out Friedman's theory that the price of a competitive fiat currency will inevitably be driven down to zero. Incidentally, that's the same theory I've been adopting in many of my bitcoin posts, and why I (mostly) sold out of the ledger a few months ago. A major data point seems to disconfirm Friedman's theory. While we've seen a new wave of coins being issued in order to exploit the value differential between cost and market price, these new coins have not been particularly successful in arbitraging away the positive price of the incumbents Bitcoin and Litecoin. When I posted this, Bitcoin's market cap was around $1.1 billion and Litecoin's at around $50 million. I take two things from this. Either we're still in the short run, and Bitcoin's price will eventually get knocked down to zero. Alternatively, something else is at work. It could be that cryptocoins are not indistinguishable fiat monies as per Friedman's theory of fiat money but rather are heterogeneous and differentiable. Multiple carbon copies of Bitcoin are simply not enough to arbitrage away the original's value because the earliest mover has superior features compared to late moving clones. To begin with, incumbents like Bitcoin and Litecoin have already attracted a large mining community. The hashing power that the miners bring with them makes the coin more secure against 51% attacks, or forks, than upstart coins that don't have the same degree of mining power. So while the source code for a clone may be identical to the original, the degree of security inherent in each is very different. Secondly, incumbents will tend to be more marketable. Merchants may have begun to accept them, securities might be denominated in them, and formal exchanges like MtGox offer direct convertibility into US dollars. This liquidity does not emerge in medias reas, or on its own, a fact that puts Bitcoin and Litcoin clones at a disadvantage. Like the security problem above, the liquidity hurdle is difficult to overcome because, chicken-and-egg-like, you can't become liquid or secure without users, but if you're not liquid or secure you don't attract users. It appears that Milton Friedman is wrong, at least for the time being. Despite the recent onslaught of competing alt-coins, privately-issued fiat currencies like Bitcoin and Litecoin are still worth many millions of dollars. I suppose we'll have to wait another few years to see if Friedman is wrong not just about the short term, but also the long term. Until then, I'll throw in my chips with Friedman. Bitcoin's biggest competitors probably haven't arrived yet. Readers may find that George Selgin's Synthetic Commodity Money adds more dimensionality to the fiat/not-fiat distinction. Selgin argues that bitcoin is not fiat money, but belongs to a heretofore undefined category called synthetic commodity money. Many moons ago Matt Yglesias wrote that the "zero lower bound is a pure artifact of the existence of physical cash." In this post I'll argue that the zero-lower bound, or ZLB, is an artifact of our modern central bank-managed monetary system, and not the existence of cash. In a free banking system in which private banks issue banknotes, competitive forces would force bankers to rapidly find ways to pierce below the ZLB, rendering the bound little more than a fleeting technicality. What is the zero lower bound? When the economy's expected rate of return drops significantly below 0%, interest rates charged by banks should follow into negative territory. But if banks set sub-zero interest rates on deposits, everyone will quickly convert them into central bank-issued paper currency. After all, why hold -2% yielding deposits when you can own 0% yielding cash? The inability to set negative interest rates is the zero-lower bound problem. As I'll illustrate, the threat of getting stuck at the zero-lower bound would impose such huge losses on private note-issuing banks that bank managers would quickly find creative ways to circumvent the problem. Central bankers, who aren't beholden to the same financial motivations as private bankers, needn't pursue these same zero-lower bound innovations with such zeal. This distinction has significant implications for the economy. Insofar as policies designed to remove the ZLB can prevent large macroeconomic distortions, central bankers are more likely to avoid such policies and destabilize the macroeconomy than private banker who, driven by bottom line concerns, will be quick to adopt ZLB-avoiding innovations. Let's set up our free banking system. Say that the Fed ceases issuing paper currency and only creates deposits. Into this void, private banks begin issuing their own paper dollar banknotes which can be exchanged for bank deposits at a rate of 1:1. This isn't such a strange idea—for much of its history, Canada has enjoyed a privately-supplied paper currency. A few years later the economy nosedives and pessimism reigns. Private banks are desperate to decrease deposit rates into negative territory, say -4% or so. After all, banks earn income from the spread between the rate at which they borrow and the rate at which they invest. If, during bad times, a banker is investing at a -2% loss, he or she needs to be borrowing at -4% in order to earn spread income. Unfortunately for our private banker, the intervening ZLB impedes rates from dropping into negative territory. Any attempt to cut to -4% and bank depositors will flock to convert negative yielding deposits into the bank's 0% yielding banknotes. Very quickly the bank's entire liability structure will be comprised of banknotes, a disastrous outcome since a bank that funds itself at 0% while investing at -2% will go broke very quick. By penalizing cash, a bank imposes a large enough cost on cash holders so that negative yielding deposits are no longer inferior to cash. There are plenty of ways for a bank to do this. One way is to impose a negative interest rate on cash by requiring cash holders to pay to "update" their bank notes lest they expire. This update fee, which would amount to around 4% a year, would forestall depositors from making a dash for cash when the bank sets deposit rates at -4%. In times past, locally-issued "scrip" like Worgl have had negative interest rates attached to them. That central banks have been so slow to evolve strategies for escaping from the ZLB could be due to any number of factors. Central banks aren't privately owned nor are they disciplined by competition, and central bankers don't have a mandate to turn a profit. Free banks, burdened by all of these checks, would be forced to rapidly adopt ZLB-escaping strategies or perish. Further hampering efforts to get central banks like the Fed to innovate solutions to the ZLB is that these efforts might conflict with other goals. Withdrawing cash, penalizing it, or limiting conversion will put an end to, or at least diminish, the circulation of US paper dollars overseas. It might even result in the circulation of some other nation's 0% yielding currency in the US. But the universal circulation of greenbacks is one of the most potent symbols of US hegemony, real or perceived. In the interests of protecting this symbol, innovations for escaping the ZLB may get short shrift. In a free banking system, these sorts of non-pecuniary motives are unlikely to outweigh the profit and loss calculation that dictates the necessity of adopting such innovations. So the zero lower bound problem isn't a problem with cash per se, it's just a function of monopolistic intransigence. If you really want to short circuit the ZLB, better to devolve the provision of notes to profit-seeking private banks. Until then, hopefully evangelists like Miles Kimball succeed in getting central banks to adopt free banking-style contingency plans in preparation for the next time we experience a crisis that necessitates sub-zero interest rates. The idea that harsh central bank policies like banning cash or penalizing currency might mimic free banking responses is a recurring theme on this blog. Here, I hypothesized that in a world characterized by free banking, legal tender laws might evolve naturally as the result of market choice. It's a strange world. In the comments section of my post on Adam Smith and the Ayr Bank, frequent commenter John S. brought up the real bills doctrine. 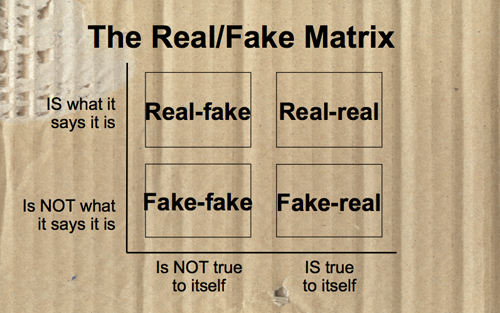 The phrase real bills doctrine gets thrown around a lot on the internet. To muddy the waters, there are several versions of the doctrine. In this post I hope to dehomogenize the various versions in order to add some clarity. Mints's RBD states that so long as only real-bills (short term liquid debt instruments created by merchants to finance inventory) are discounted by the banking system, an excess amount of notes can never be issued. When businesses require cash, they'll simply discount bills at a bank, and when that cash is no longer required, they'll pay back their borrowing. Even in a world *without* note convertibility into specie (a "fiat standard") the real bills stipulation alone is sufficient to keep the price level anchored. Mints rightly declared that this version of the RBD was "completely wrong". After all, a central bank not constrained by convertibility might discount only real bills, yet by discounting at an unreal price, it would alter the purchasing power of the notes it issues and create either runaway inflation or deflation). The price level was indeterminate in Mints's RBD-world. Though tarred and vilified, poor Adam Smith never actually conformed to the real bills doctrine as described by Mints. This has been pointed out by David Laidler in his 1981 paper Adam Smith as a Monetary Economist, one of the first efforts to rehabilitate Smith's reputation as a monetary theorist. Smith lived in an era in which paper money was fully convertible into a fixed amount of gold. Mints's description of the RBD, on the other hand, applies to a fiat world. For Smith, the gold convertibility clause was sufficient to ensure that the economy needn't endure an excess amount of notes. After all, should banks as a whole issue more than was desired, the public would return the notes en masse for specie. This is the so-called reflux process. That being said, Smith did mention real bills several times in the Wealth of Nations. He famously advises banks that they should only discount "real bills of exchange drawn by a real creditor upon a real debtor." (I go into some detail in my last post on the personal and historical reasons that may have motivated Smith to advocate this position). Why limit discounts to real bills? When the banking system issues excess paper currency, gold convertibility ensures that this excess will soon reflux back to issuer. A bank that holds long term loans and bonds issued by speculators will be insufficiently prepared to meet the demands of reflux since liquidating such debts might take time. A bank that holds short term bills issued by credit-worthy merchants will be better equipped to meet redemption demands, and less likely to meet the same demise as that experienced by the Ayr Bank, a bank run that Smith personally witnessed. Why did Mint's cast Adam Smith as his first thorough-going exponent of the RBD? In 1797, some seven years after Smith had died, Britain went off the gold standard. (See this post for details). The pound soon began to trade at a discount to its pre-1797 gold value. In other words, the pound was capable of purchasing less gold. The Directors of the Bank of England found themselves accused of creating inflation, notably by the members of the 1810 Bullion Committee. One of the apologizers for the Directors, Charles Bosanquet, a pamphleteer, wrote a famous rebuttal in 1810 that insisted that by limiting discounts to "solid paper for real transactions," the Bank could not have contributed to a deprecation of the pound. According to Bosanquet, several factors outside of the Bank's control had caused the deprecation. To help buttress his point, Bosanquet invoked the name of Adam Smith. Wrote Bosanquet: "The axiom, or rule of conduct, on which the Committee has been pleased to heap contempt and ridicule, respecting which they have declared that the doctrine is fallacious, and leads to dangerous results, was promulgated by, and is founded on, the authority of Dr. Adam Smith." Bosanquet's appropriation of Smith's name was inappropriate since Smith implicitly assumed gold convertibility. But the damage had been done. From then on, economic historians like Mints would automatically associate Smith's name with the arguments of the Directors. The Directors' RBD is very much a manifestation of Lloyd Mints's RBD, which we already know was a poor guide for monetary policy. Years later, Walter Bagehot would write that when the Directors were examined by the Bullion Committee in 1810, "they gave answers that have become almost classical by their nonsense". If anyone deserved to be castigated as the first thoroughgoing exponents of Mints's real bills doctrine, it was the Directors and not Smith. If you've spent some time wading through the online monetary economics community, you'll have run into Antal Fekete's real bills doctrine. This is an attempt to apply a warmed over version of Adam Smith's RBD mixed in with some Austrian free market economics. Conversely, rehabilitating the real-bills system would end chronic unemployment and reduce the size of government. I only have a passing knowledge of Fekete's thinking — it really doesn't do much for me —so hopefully someone in the comments section can pick up the slack. Of the modern reincarnations of the RBD, I'm far more familiar with Mike Sproul's version. Mike's version is an application of modern finance to monetary economics. The price of a financial asset is determined by the discounted value of the expected flows of cash thrown off by underlying capital. Alcoa's stock price, for instance, will equal the sum of discounted earnings that Alcoa's machinery and employees are expected to generate. Transferring this idea to the monetary landscape, Mike says that value of modern central bank liabilities should be determined by the earnings power of the assets held by that central bank. Like the other versions of the RBD, Mike's version shares a preoccupation with the asset side of a bank's balance sheet. But that ends their similarity. For instance, Mike doesn't have a fetish for actual real bills. I doubt he'd agree with the Directors that so long as they only discounted short-term mercantile bills of exchange, they'd never cause a decline in the value of the pound. That's why I prefer to call Mike's RBD the backing theory. It's a very different beast from the RBDs of Mints, Smith, Fekete, and the Bank Directors, and to share the same name only adds to the confusion. So there you have it. If you're going to have an argument over the RBD, make sure you know which one you're arguing about! 1. Fischer Black received this letter from Milton Friedman on August 6, 1971: "With respect to your so-called passive monetary policy, here you are simply falling into a fallacy that has persisted for hundreds of years. I recommend to you Lloyd Mints' book on The History of Banking Theories for an analysis of the real bills doctrine which is the ancient form of the fallacy you express. Do let me urge you to reconsider your analysis and not let yourself get misled by a slick argument, even if it is your own. " Ouch. Play nicely, Milt. I get this via Perry Mehrling's book on Fischer Black. 2. Here's a video of Lloyd Mints in 1988 upon his 100th birthday. It's interesting to see how after a credit crisis, economists start to take money and banking a bit more seriously. Adam Smith, who experienced his very own credit crisis -- the collapse of the Douglas Heron and Co, or the Ayr Bank, on June 22, 1772 -- is no exception. His views on money and banking became much more nuanced after that event. Ayr Bank had been founded in 1769 in the Scottish town of Ayr. It expanded to Edinburgh and Dumfries, and in only a few short years it had succeeded in wrestling a significant chunk of Scottish banking business from incumbents the Bank of Scotland and the Royal Bank of Scotland. By 1772, according to Checkland, the Ayr Bank supplied 25% of Scotland's bank notes and deposits. In early June 1772 one of Ayr's largest customers, Alexander Fordyce, skipped London for Paris to avoid debt payments. A run on the Ayr Bank began that precipitated the bank's failure by the end of the month. We are here in a very melancholy Situation: Continual Bankruptcies, universal Loss of Credit, and endless Suspicions. There are but two standing Houses in this Place, Mansfield’s and the Couttses: For I comprehend not Cummin, whose dealings were always very narrow. Mansfield has pay’d away 40.000 pounds in a few days; but it is apprehended, that neither he nor any of them can hold out till the End of next Week, if no Alteration happen. The Case is little better in London. It is thought, that Sir George Colebroke must soon stop; and even the Bank of England is not entirely free from Suspicion. Those of Newcastle, Norwich and Bristol are said to be stopp’d: The Thistle Bank has been reported to be in the same Condition: The Carron Company is reeling, which is one of the greatest Calamities of the whole; as they gave Employment to near 10.000 People. Do these Events any–wise affect your Theory? Or will it occasion the Revisal of any Chapters? Of all the Sufferers I am the most concern’d for the Adams, particularly John. But their Undertakings were so vast that nothing coud support them: They must dismiss 3000 Workmen, who, comprehending the Materials, must have expended above 100.000 a Year. They have great Funds; but if these must be dispos’d of, in a hurry and to disadvantage, I am afraid the Remainder will amount to little or nothing. Hume asks if these events affect Smith's theory, the Wealth of Nations having not yet been published. In a letter to William Pulteney dated September 1772, a few months after the bank crisis, Smith notes that the events had indeed delayed the finishing of his book, which otherwise would have been completed that winter. When it was eventually published in 1776, Book II, Chapter II of the Wealth of Nations would include a long description of the Ayr crisis (though Smith never mentions the bank by name, most probably to protect those involved, see below). Tho I have had no concern myself in the Public calamities, some of the friends for whom I interest myself the most have been deeply concerned in them; and my attention has been a good deal occupied about the most proper method of extricating them. According to Antoin Murphy and John Rae [biographer of Smith], the friends to whom Smith refers to probably included Smith's patron, the Duke of Buccleuch. The Duke was one of Ayr Bank's largest shareholders, and the source of Smith's £300 a year pension. Murphy intimates that as adviser to the Duke, Smith would have been privy to much of the gritty details of the bank's demise, as well as advising Buccleuch in the ongoing legal proceedings against the shareholders and directors of the bank. No doubt Smith had plenty to reflect on, including the fact that he might lose his pension. I ask’d the Question you proposd; and was told by Sir William Forbes, that tho’ they did not commonly take the Air Notes, yet he woud upon your Account: You may therefore send them over by the first Opportunity. Not only did the collapse of Ayr put Smith's benefactor in financial trouble, but it seems that Smith himself was in possession of a few Ayr banknotes. Could it be that Smith himself was burned by the Air collapse, only to be helped out by William Forbes, an Edinburgh banker who had survived the crisis and generously agreed to take the notes off of Smith's hands? Or was Smith simply using his connections to help out a London-based friend who was stuck with Ayr Bank notes? In any case, Smith's views on banking were inevitably modified by a crisis. According to Murphy, Smith became more conservative monetary theorist relative to his pre-1772 stance. Here is a quote from Smith's earlier Lectures on Jurisprudence, about six years before the crisis, in which he pooh-poohs the danger of banking crisis. In The Wealth of Nations, Smith's benign view of banks was modified. No doubt influenced by his first hand experience of the Ayr collapse, Smith realized that the ruin of banks could have far greater consequences than he had earlier assumed. He went on to describe a set of guidelines that banks might use to avoid bankruptcy. Bankers, Smith wrote, should always verify that the bills of exchange upon which they issued credit (bills were a common collateral security accepted by banks) had arisen as the result of solid transactions between "real creditors" and "real debtors". Fictitious bills of exchange -- bills whose provenance was obscure and were usually issued by those whom Smith called "projectors", or speculators, and accepted (or co-signed) by collaborating projectors -- were to be treated with skepticism. The blogosphere's very own David Glasner describes this set of rules in this paper. Like Smith, modern day economists are busily reappraising pre-2008 modes of thought, much of which abstracted from money and banking altogether. They have much to reflect on too. If Smith were alive today, he'd no doubt wonder why banks had lent on such unverifiable collateral, most of which in his eyes would appear to be entirely fictitious. 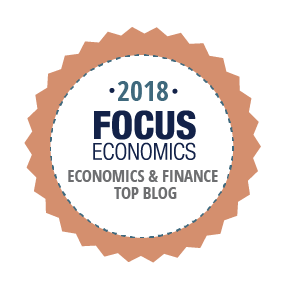 1: Much of this blog post is indebted to Antoin Murphy's chapter on Adam Smith in The Genesis of Macroeconomics. 2. For a full account of the demise of the Ayr Bank, here is the 1778 inquiry into the affair , or The Precipitation and Fall of Mess. Douglas, Heron and Co, Late Bankers in Air With the Causes of their Distress and Ruin Investigated and Considered. They sure loved long names back then. James Gillray, a popular caricaturist, drew the above cartoon in 1797. In it, England's Prime Minister William Pitt the Younger is fishing through the pockets of the Old Lady on Threadneedle Street -- the Bank of England -- for gold. At the time, England was in the middle of fighting the Napoleonic wars and its bills were piling up. According to its original 1694 charter, the Bank of England was prohibited from lending directly to the Treasury without the express authority of Parliament. Over the years, the Bank had adopted a compromise of sorts in which it provided the government with limited advances without Parliamentary approval, as long as those amounts did not exceed £50,000. In 1793 Pitt had this prohibition removed and in formalizing the Bank's lending policies, imposed no limit on the amounts that could be advanced by the Bank. Thenceforth Pitt made large and continuous appeals to the Bank for loans. Without the traditional Parliamentary check, there was little the Bank could do except satisfy Pitt's demands. As Pitt liberally spent these borrowed funds in Europe, gold began to flow out of England in earnest, a pattern that was compounded by an internal gold drain set off when a small French force invaded Ireland in early February 1797, causing a crisis of confidence in banks. Pitt suspended convertibility of Bank of England notes into gold on February 26. England would not go back onto the gold standard until 1821, some twenty-four years after Pitt had taken it off. Having removed both Parliament and the gold standard as checks, Pitt had effectively turned the Bank of England into the government's piggy bank. Thus the inspiration for Gillray's caricature of a groping William Pitt. To some extent, Gillray's worries were borne out as a steady inflation began after 1797. However, the Pound's inflation over that period came far short of the terrible assignat hyperinflation that had plagued France only a few years before. The fears so aptly captured in Gillray's caricature were never fully realized. Pitt's robbing of the old Lady on Threadneedle street illustrates an episode in which the traditional English divide between Bank and State was removed. Both the Treasury and the Bank of England were effectively consolidated into one entity with the Treasury calling the shots. The last decade or two illustrate the opposite -- the re-erection of walls between Bank and State. If you browse the asset side of the Bank of England's balance sheet, for instance, you'll notice an entry called Ways and Means advances to HM Treasury ("Her Majesty's Treasury"). Ways and means advances are direct loans to the government. They are generally short term, designed to provide the government with temporary financing to plug gaps between expected tax receipts. Ways and means advances provide the government with an extra degree of freedom because they offer an alternative avenue for funding. Rather than relying on the bond market or the taxpayer for loans, the government can tap its central bank for money. Ways and means advances are very much like banking overdraft facilities. Unlike a regular loan, the borrower needn't provide a detailed account of what the overdraft will be spent on, nor do overdrafts require specific collateral. They are provided automatically and without fuss. While any sovereign would welcome the opportunity to directly borrow from a central bank, from the perspective of the lending bank, overdrafts are risky. First, they are illiquid. Other central banking operations, say open market operations, bring a marketable asset onto the central bank's balance sheet, giving the bank the flexibility to rid itself of that asset whenever it sees fit. Secondly, overdrafts are uncollateralized. Should the borrower go bankrupt, the central bank lacks a counterbalancing asset to compensate itself for its loss. While the Ways and Means overdraft amount to a piddling £370 million, or 0.1% of the Bank's portfolio of assets, in times past it was very large. See the chart below, cribbed from this Bank of England publication. At various points in the late 1990s, The Bank's Ways and Means overdrafts amounted to as much as £20 billion. Given the fact that the Bank's note issue then stood at around £25 to £30 billion, Ways and Means advances provided as much as 80% of the backing for paper pounds! Insofar as the value of currency is set by the assets that back the issue, the purchasing power of the pound during the 1990s depended very much on the quality of these Ways and Means advances. Why did Ways and Means advances contract? In 1997, the government decided that it would cease using the Bank of England as its source for short term financing and instead would turn to money markets. The final changeover occurred in 2000, at which point the Ways and Means balance was fixed at £13.4 billion, and eventually paid down to £370 million in 2008. Thus ended the Treasury's ability to turn to the Bank of England for financing. As for the Bank, it had earned for itself a larger degree of flexibility -- a large and illiquid asset no longer existed on its balance sheet. There seem to be a few reasons for ending Ways and Means advances. To begin with, the Treasury was already in the process of handing over its control of monetary policy to the Bank of England. Prior to 1998, the Treasury had been responsible for setting rates. Subsequent to 1998, the Bank of England's Monetary Policy Committee has set rates. The decision to freeze and eventually pay down Ways and Means advances went hand in hand with the Bank's increased independence in setting monetary policy. Secondly, the third stage of European and Monetary Union (EMU) requires that all member nations cease to lend directly to their government. While the United Kingdom is a signatory to EMU, it never proceeded to the third stage, so it was not required to end Ways and Means advances. Nevertheless, given the possibility that it might proceed to the third stage at some future point in time, it probably made sense to plan ahead by ensuring that the government had already established a viable short term financing alternative to the Bank of England. While Ways and Means advances are no longer used, the mechanism isn't dead. The interactive chart below illustrates the Bank of England's balance sheet since 2006. Let's remove all component assets except for ways and means advances, the purple series, and see what we get. As the chart illustrates, after being paid down in early 2008, Ways and Means advances spiked briefly in late December 2008 to £20 billion only to fall back by April 2009 to £370 million. According to this Bank of England report, the explanation for this spike is that the Treasury briefly borrowed from the Bank to refinance loans that the Bank had earlier made to the Financial Services Compensation Scheme and to Bradford & Bingley. Bradford & Bingley was a failing bank that was nationalized by the UK government in September 2008. The Bank of England had lent around £4 billion in emergency "Special Liquidity Scheme" funds to Bradford & Bingley as it coped with withdrawals. The SLS had been established earlier that year to improve liquidity of the UK banking system. 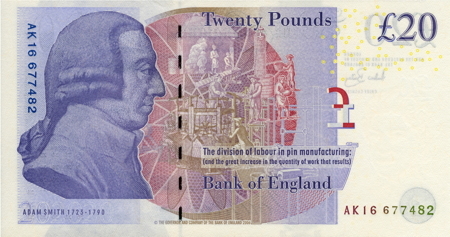 All Bank of England funding via the SLS was indemnified by the Treasury, so any loss that resulted from supporting Bradford and Bingley up until nationalization would have been absorbed by the Treasury, first by taking on the loan itself and funding that loan via ways and means advances from the Bank of England, and then paying the Bank back by April. The FSCS, the UK's deposit insurance authority, was able to make good on B&B's deposits through a short term loan from the Bank of England, which was quickly replaced by a government loan financed by Ways and Means advances, which in turn was paid down by the government by April. Just as Ways and Means mechanism provides the government with the ability to meet sudden spending requirements during war, it provided the same during a period of financial crisis. Where does the Bank of England stand relative to other central banks? Although the Bank of England has secured itself a significant degree of financial independence relative to the 1990s and Pitt's era, compared to the Federal Reserve/US Treasury relationship the Bank of England/HM Treasury is much tighter. The Fed has been legally prohibited from granting overdrafts to the government since 1980, as I've outlined here. While Bank of England Ways and Means advances are no longer the modus operandi, they haven't been legally struck out of central bank law as they have in the US. Direct advances to the government could be back one day, with a vengeance. Compared to the Bank of Canada/Department of Finance relationship, the interface between the Bank of England and HM Treasury is fairly tight. As I've outlined here, the Bank of Canada has the ability to directly lend significant amounts to the government over long periods of time. Indeed, the Bank of Canada is currently purchasing record amounts of bonds in government debt auctions, providing the Finance Department with a continuous overdraft of sorts. Few governments in the western world have the ability to harness their central bank in such a manner. In general I think it's healthy to establish well defined boundaries between a nation's central bank and its executive branch. Ever since John Law's Banque Royale was nationalized in 1718 and then looted by King Louis XV, scholars have been attuned to the dangers of excessive state control over the issuing power of a nation's monopoly monetary body. That being said, central bank overdrafts needn't necessarily lead to the sorts of hyperinflation seen in Law's day. The Bank of England provided overdrafts to the Treasury for centuries without igniting prices. The gold standard acted to discipline excess use of the overdraft facility, but in modern days a well-publicized inflation target should be sufficient to reign in any silliness. Absent the discipline imposed by inflation targets, the ability to enjoy central bank financing may be too tempting for a sovereign to forgo. Strict limits or all-out bans on overdraft facilities may provide a needed degree of redundancy. Most of the information concerning the Pitt era comes from Eugene White and Michael Bordo's British and French Finance During the Napoleonic Wars, as well as Henry Dunning Macleod's excellent Theory and Practice of Banking, Volume I.
 I get this from Sayers's The Bank of England, 1891-1944.